Co-recruitment of GFP-tagged RNA polymerase II. Note that the brightness has been adjusted non-linearly (gamma = 0.65) for better visibility of the signals at the array and within the nucleoplasm. 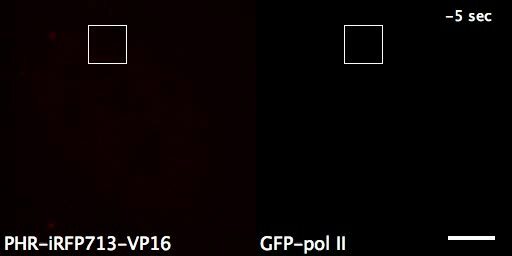 PHR-VP16 was tagged with far-red iRFP713. Speed: 4 fps (~20x). Scale bar: 5 μm. The movie is provided as a separate file in mp4 format.